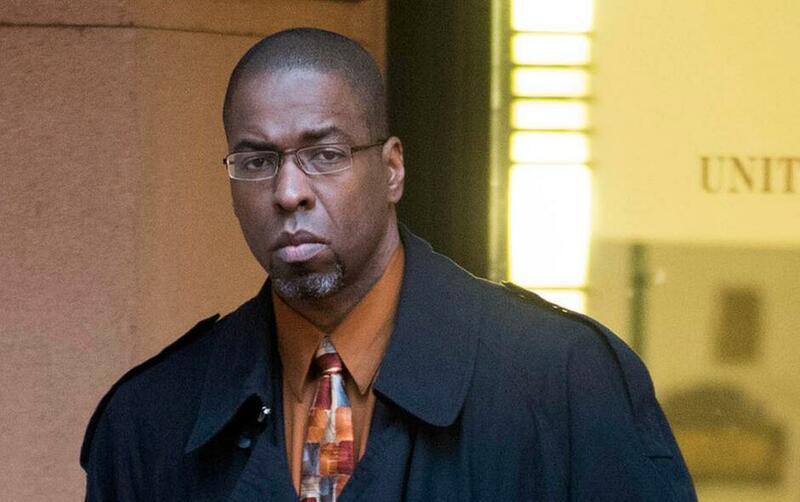 Former CIA officer Jeffrey Sterling leaves federal court in Alexandria, Va. A three-judge panel of the 4th U.S. Circuit Court of Appeals will hear Sterling's case on Tuesday, Dec. 6, 2016. A jury convicted Sterling on all counts last year after he was charged under the Espionage Act for leaking details of a CIA mission to New York Times journalist James Risen. RICHMOND, VA. (AP) — Once an employee of the powerful CIA, Jeffrey Sterling now sits behind bars at a federal prison in Colorado. He bides his time by reading and writing and working at the facility's recreational center. A jury convicted Sterling on all counts last year after he was charged under the Espionage Act for leaking details of a CIA mission to New York Times journalist James Risen. The 4th U.S. Circuit Court of Appeals will hear arguments in Sterling's case on Tuesday. Risen described the mission in his 2006 book "State of War." Citing anonymous sources, Risen suggested it was a reckless and botched operation that may have actually helped advance the Iranians' nuclear program. The CIA has strongly disputed that idea. "Sterling's actions destroyed the program, endangered the lives of a covert human asset and his family, and compromised the United States' ability to prevent the spread of nuclear weapons," prosecutors wrote in their appeals court brief. U.S. Attorney Dana Boente's office declined to comment ahead of the 4th Circuit hearing. Sterling has maintained that he was not Risen's source, and Risen never testified during trial. His attorneys argued that the leak likely came from a Capitol Hill staffer after Sterling shared his concerns about the program with staffers at a Senate intelligence committee in 2003. His attorneys and other advocates claim prosecutors only went after Sterling because Risen's story made the CIA look foolish. "If Risen had written a story about how this was a superb operation that successfully set back the Iranian nuclear program, I don't think there is any chance whatsoever that Mr. Sterling would have been charged," said Barry Pollack, who represented Sterling at trial. On appeal, Sterling's attorneys argue that, among other things, his conviction should be reversed because prosecutors never proved that Sterling ever disclosed any secret information in the Eastern District of Virginia, where the case was tried. They also argue that the lower court inappropriately allowed prosecutors to tell jurors about Sterling's mishandling of other CIA documents. His attorneys are urging the 4th Circuit to grant Sterling a new trial. Sterling's prison sentence currently expires in 2018, but his wife said he may be released as early as next December if he maintains good behavior. Holly Sterling said her husband has recently been struggling with health issues and fears he could die in prison. She said she knows that the odds that the 4th Circuit will side with Sterling are long, but she remains hopeful.